Underground Energy performed a prefeasibility study of Borehole Thermal Energy Storage (BTES) for an underground diamond mine in Canada’s Northwest Territories. BTES heat stores are well suited to subarctic climates where surplus heat available in summer can be stored underground to provide heat in severe winters. The mine, located in an extreme subarctic climate, combusted diesel fuel in furnaces to heat ventilation air during winter months, when air temperatures routinely fall below -30°F. Because the diesel generators rejected heat to the atmosphere during the summer season, an opportunity was identified to displace about 2 million liters of diesel fuel consumption annually with the BTES project. The BTES system enables the summer capture, seasonal storage and beneficial winter reuse of heat from the powerhouse that is otherwise wasted during summer. Figure 1 - BTES allows thermal balance of annual heat loads. Our conceptual design involved a BTES borefield consisting of 1,000 borehole heat exchangers (BHXs), each to a depth of 100 m, using a BHX spacing of 3 m. The resulting 5.5 MW BTES field comprises 100 km of vertical BHX in a circular area with a diameter of 100 m, or about 900,000 m3 of rock volume as the underground heat store. Surplus heat from diesel generators that is otherwise wasted during summer months is transferred to the BTES field via a glycol loop to connect the powerhouse, ventilation intake and BTES borefield. During winter, the BTES field is discharged and used to preheat the ventilation air. Underground Energy performed a regulatory analysis that concluded the BTES project could be undertaken consistent with existing land and water use permits. A preliminary risk assessment and was also performed and risk mitigation measures were recommended. Because the subsurface thermal effects do not propagate far from the BTES, and because the BTES is distant from mine workings, Underground Energy concluded that the risks were manageable. A numerical model was developed to predict the development of a talik (melted permafrost) around the operating BTES field. 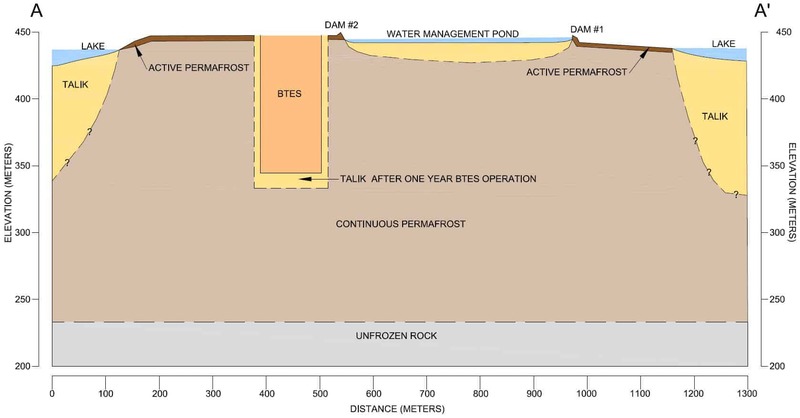 Operating the BTES at temperatures from about -4 °C to 55 °C for ten annual charge/discharge cycles will melt permafrost in the surrounding rock to an estimated distance of about 40 m from the perimeter of the BTES field. The financial benefit of the project was calculated as a simple payback, without any outside financial incentives, of 7 to 10 years, depending on diesel prices.